Green Industries of Colorado - Sigler Communications, Inc.
Colorado has endured two if its worst droughts at the start of the this century. Both droughts have forced water providers to severely limit outdoor watering, which has a huge impact on the green industry. On behalf of a coalition comprised of landscape, agriculture and nurseries and a 20-year client relationship with the Associated Landscape Contractors of Colorado, Sigler Communications managed and coordinated the communications interface between this group and Denver Water, Aurora Water and utilities on issues related to water conservation and landscaping during recent droughts. This work included the development of educational materials for the public, advocacy materials to use with water utilities, media messaging, press releases, spokesperson training and media placements. Additionally, we coordinated elected official outreach and managed editorial board briefings with local and national newspapers. We also have worked with ALCC on its award-winning website. In 2013, Sigler Communications wrote and designed a series of education fact sheets and videos for GreenCO on landscape and water-wise conservation practices that were made available to GreenCO for co-branding, very similar to the Colorado WaterWise Value of Water campaign. 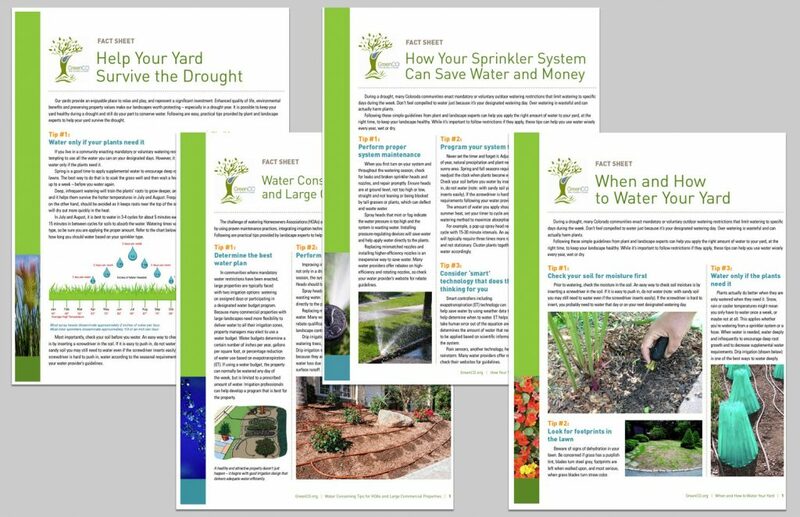 The fact sheet topics included: How Your Sprinkler System Can Save Water and Money; Water Conserving Tips for HOAs; When and How to Water Your Yard; Xeriscape is Not a Garden, It’s a System; and Help Your Yard Survive Drought. We also wrote and produced four videos including: Helping Your Yard Weather Drought; Xeriscape is a System, Not a Garden; Sprinkler Tips to Save Water and Protecting Your Trees in a Drought. All the materials were based on best management practices and we worked to simplify this information for a lay audience.